I consider myself to be a local in these parts but not quite. I was born here, went to school here, left for the obligatory time at uni and gave the world away from the Dale a reasonable chance and then, happily, returned able to say that I had ‘seen the world’. I’m now back where I started and have no intentions of straying far. Local through and through. Not quite as local as a certain breed and never will be. The farmers hold a separate status. It’s hard to explain but however long your family has been here, however deep your connections you can never, ever, achieve the ‘local’ status of a farmer. 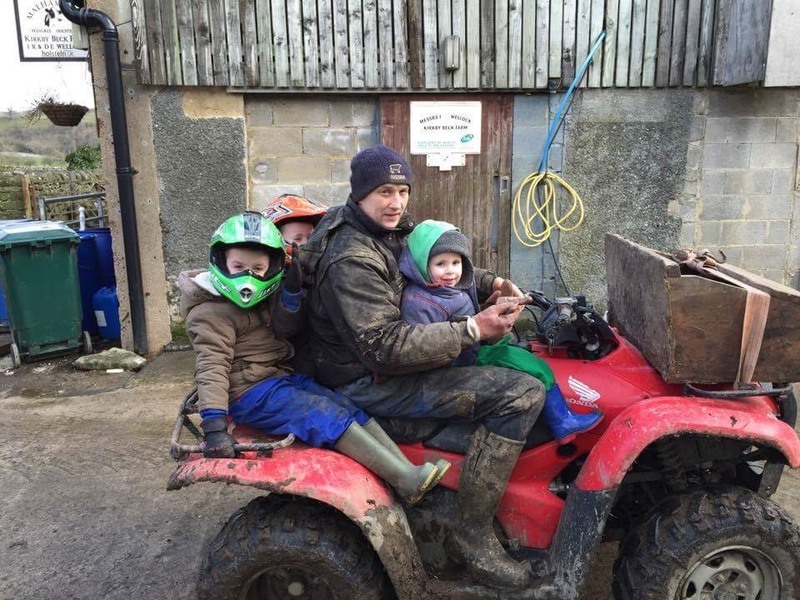 I even had a brief foray into ‘pretend farming’ – purchased a few motley ewes and experienced lambing time first hand for a number of years. That doesn’t count. It didn’t help my attempts to be a part of the ‘farming club’ when one year, having watched all my ewes swell and look more and more matronly as the weeks passed and lambing time loomed …and passed…with no additions to my flock, it became clear that our tup was a dud and my ewes were overfed and more intent on joining the ever growing obese section of society than producing offspring. The shame. I realise that there is nothing I can do to achieve the heady heights of the Dales farmer. As a child at the local school the children from farming families were quietly revered. Days off for lambing and hay time were standard. My dad worked in textiles. A day off to help out at the mill would be scorned but no one dare argue with a farmer. I remember, years later, being on the management committee of the local playgroup. One of the members of staff was a farmer’s wife. She would only take the position if she could have time off for lambing. No one thought that was strange. Farmers round here have many idiosycrancies unique to them. There is the ‘Malhamdale wave’ – so dubbed by our late resident celebrity, Bill Bryson. It is the slow, cursory rise of the index finger directed at you (usually with no accompanying eye contact or change in facial expression) as you pull in for a farmer to pass as they make their way, often hell for leather, down the narrow roads with a confidence that causes tourists, cyclists, walkers and the walls and hedge side vegetation to tremble in their wake. But pull in you do. It is clear that they have a job to do and god forbid that anyone impinges their progress in any way. Farming has always seemed to be the pinnacle in terms of careers, the only job that can really earn you true respect but it is something you are born into not a career path you can really chose. They are a proud breed and would do no other job. Although it is an unspoken, well acknowledged fact that they work harder than anyone else on the planet, 24hrs a day 7 days/week. That’s probably true. I live opposite a dairy farm. It’s 24/7 365 days a year. A day away with this wife and 4 young children is a novelty. The family had a day at the seaside last week and it is the first time I’ve seen them leave the farm as a family for the day that I can remember. There is no doubt that it is a hard life. Foot and mouth left scars that will be a long time healing. The dairy herd across the road from me is relatively new. I will never forget the day the 20 year old farmer sat in my kitchen, head bowed, eyes filled with tears, numb with shock as the slaughter men employed by DEFRA systematically destroyed his family’s life work. They appear to be a hard bunch but they care deeply. The field next to my house is often used a ‘sick bay’ for cows that are struggling for one reason or another. It is currently resident to a 12-month-old heifer who managed to find herself at the bottom of a stony crag somewhat worse for wear. It’s been touch and go. She’s struggled to get to her feet unaided and each day has been patiently and quietly helped to a wobbly upright position, often to crumple straight back into a seated heap. I happened to be in my garden the day she made it upright unaided. Four little boys sat on the wall and watched, delighted as she heaved and lurched her way from the floor. Their faces said it all. These animals are more than milking machines, a way to put bread on the table (and hardly that with the price they get paid for their milk), they matter – each and everyone of them. They are part of their family and have a name, a role and a place within that family. It’s a given that the boys help on the farm. 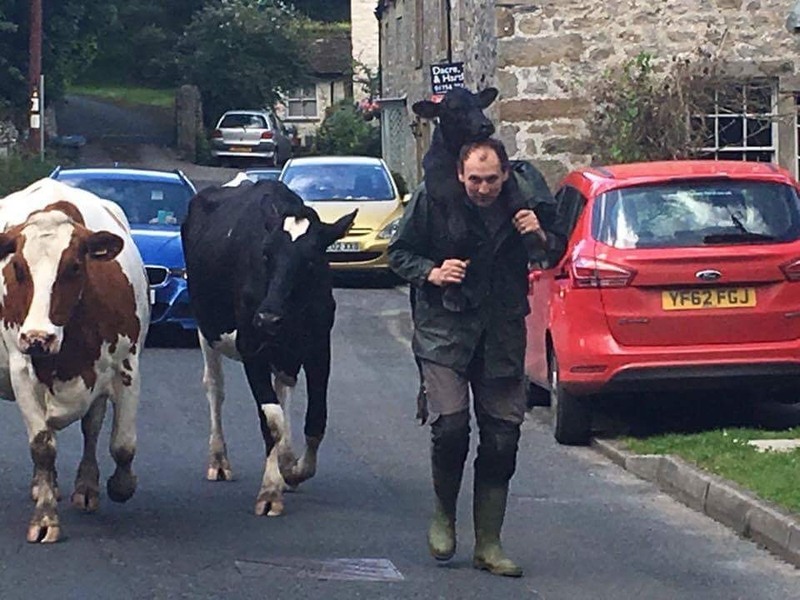 I’m glad that my children didn’t have to suffer the indignities of spending their days kicking a football round the garden, idling the long summer holidays away with friends and games only to watch the boys across the road bring the cows in on their quad – driven solo from the age of 7. They have a status and a role from the moment they can walk and are proud of the part they play in the family business. They have a status in the local pub too. You can always tell when they are there – especially the younger generation. I teach teenagers and they sometimes show me pictures of them ready for a night out. Transformed from the spotty scruffs who adorn the desks at my college into glamour models, suited, booted and ready for the kill. Not so with our local farming youth. You can tell they are in the pub because the smell hits you when you open the pub door. A pleasant (ish) smell of sheep and cow that is ingrained in their skin and clothes. It can be removed with a good scrub and for a proper night out – but for a pint in the pub after a hard day it’s ok to be accompanied by that special odour. I often wonder if they ever think about what they have really taken on. Despite the fact that they make little money, that the days are long, hard and relentless – the same year in, year out, they would do nothing else. It is the family way and has been so for generations. It’s a closed shop. Grandad, dad and son. Occasionally and more so now, a daughter will be brave enough to take up the mantle. A hard choice but one I respect. There is no doubt that they will have to perform to achieve – and perform somewhat better than yours truly with her fat, barren ewes. It’s a tough life choice but they are a breed apart and I suspect that’s the case countrywide. A kind, hardy, determined set of folk who would quietly help you if the need arose and expect no thanks in return. The land is theirs for generation to generation. I walk, run and cycle across it and feel I know it better than most but they know it in a different way. Each field has a name, a function; it’s own personality in terms of production, drainage, ability to keep stock in, places to shelter new born lambs and walls for the cattle to huddle behind as winter takes hold. I started my life here and God willing, will end it here. I love the dale and would love to call it mine but I don’t. Whilst the visitors who spend time in my b and b think I am a true local, I know that there will be some small part of me that is always ‘off cumdon’, and it will be the same for my children. Great article Bridget and so very true! She’s a good “un”, wonder what’s coming next?! Anyone who can write like that is not an offcummedun. You belong lass. Next PostNext The Whitby What?… The Whitby Way!